I enjoy eating fresh cinnamon rolls with a hot cup of coffee. The Pillsbury Cinnamon Rolls are super fast and easy to make. They are great to whip up when company pops over unexpectedly and you want something tasty to serve. I wondered what those same flavours would taste like in a coffee? Turns out, they taste pretty darn delicious! I used vanilla ice cream and a teaspoon of cinnamon and then poured in my coffee into a blender. I made Pillsbury Cinnamon Rolls too so I used a little bit of the frosting that comes with it to rim the glass. That’s not required though and it will still taste yummy if you leave that step out. 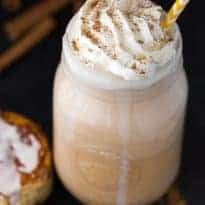 Give this easy coffee milkshake recipe a try or if you prefer, make one of my other recent recipes. I’ve been sharing a bunch! You can find them in my Beverages recipes. Do you love the flavour of cinnamon rolls? Tastes just like a cinnamon roll! Super creamy, cold and delicious. Rim two glasses with vanilla frosting or glaze if you wish. Set aside. 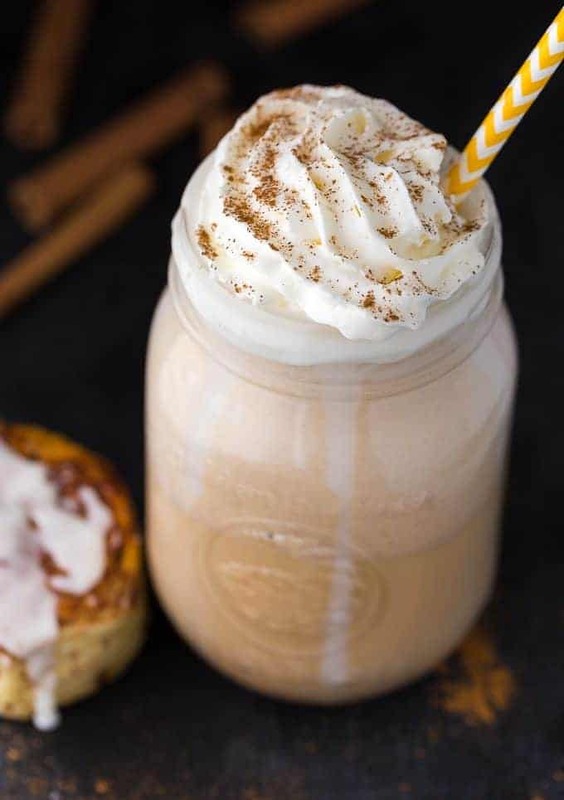 Add ice cream, cinnamon and coffee to a blend. Blend until smooth. Pour into glasses. Top with whipped cream and a sprinkle of cinnamon. Does sound like perfection to me! Another great milkshake idea, mind you if I tried them all I think I might start gaining some weight! well this sure is different! very tasty! This sounds so yummy! I am writing this recipe down to try it for the kids and me. I’d like it without the coffee since I don’t like coffee. This is different and looks so good! looks very yummmy i love coffee and this looks interesting! I love coffee will have to try this one! I pinned this, I just might have to make this. I looks so good!! This recipe looks too yummy! I love the combination of cinnamon and coffee. I love cinnamon rolls but I generally don’t like flavoured coffee. Or coffee-flavoured things. I love black coffee! My gf would love to try one of these! Perhaps I will make a few for her and not me as I dislike the taste of coffee. Oh yum! I want to make this. It looks so delicious and fun to make. 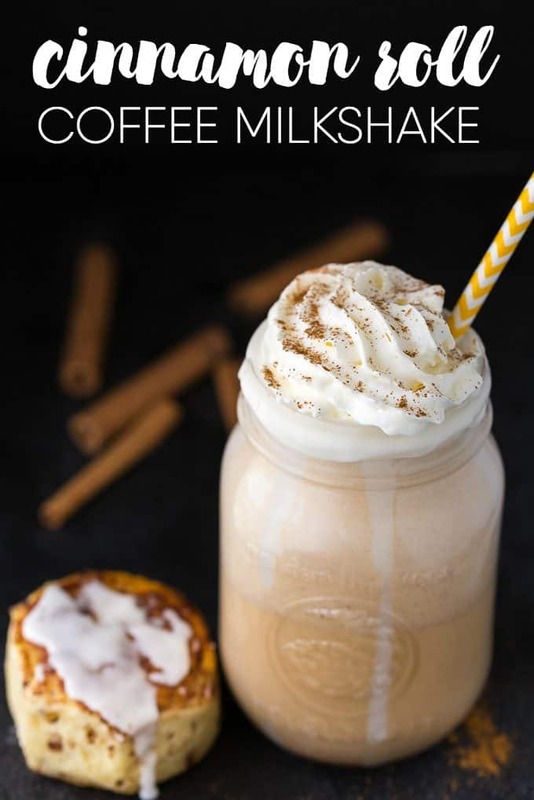 I love milkshakes and the kids would love to make these! That looks delicious and I’ll definitely have to try it. Thanks for sharing at Merry Mondays. Wow, this looks so delicious, can’t wait to give it a try. Love the addition of coffee. You’ve done it again Stacie – this looks amazing! What is not to love about this!?? It’s 3:30 in the morning and I’m wanting to run upstairs to make this… Probably shouldn’t. This sounds amazing! I too love a good cup of coffee and a cinnamon roll (or two or three…). This would be the perfect summertime treat! Thanks for sharing! Your Milkshake will be fantastic, can’t wait to try it! Thanks so much for sharing with us at Full Plate Thursday and have a great weekend! This looks absolutely amazing and so tasty! Thanks for sharing on Wonderful Wednesdays. This looks amazing. I actually feature your coconut milk shake from last week’s party from Dishing it and Digging it link party. Thank you again for sharing this yummy shake. I am going to make it for sure. Yummy! Thanks for partying with us and have a great week. I love cinnamon rolls! This drink sounds so delicious! Thanks for linking up with our Merry Monday party. Oh man, this looks soooooooooooooooooooo good!! I am going to have to check the list and make it too! Thanks! Cinnamon rolls are one of my favorite sweet items. I never thought to turn one into coffee or a milkshake.